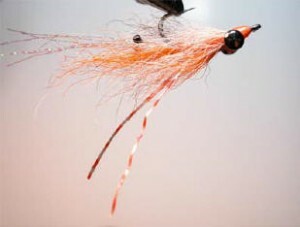 Tail: Mixture of 50% orange and 50% tan Kip tail, tied in at the mid hook bend. Flash: 3 to 4 strands of rootbeer krystal flash tied in above tail. Rearward facing eyes: 10 lb. hard mono, burned and painted black. Legs: White Flexi-Floss, accented with red markings. Body: Danville Flat Wax Nylon – orange. Belly: Mixture of 90 %orange and 10% tan kip tail. Weighted eyes: 5/32 to 3/16 black nickel. This fly was originally developed for fishing for corbina in calm clear waters such as Alamitos Bay in Long Beach. It has proved successful however in all surf conditions, especially when fished in the wash when corbina are present and rushing the beach.